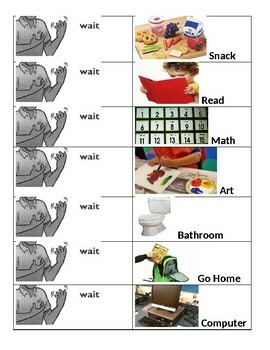 This is a visual schedule that includes photographs depicting the most common activities in special education classrooms - it's a Word doc so you can rearrange the schedule to fit your own in your classroom. Photographs are used to help those pre-symbolic children. The way it works is that you cut out the tables, laminate, and then cut slits onto each row on the left hand side. Put Velcro on the far left of the left row and far right of the right row. Then, as each task is completed, you close the flap, covering up the activity. Draw a check on the other side of the flap, so the children can see that activity has been completed. This way, at a glance, kids can see where they are in their daily schedule, it's easy for you to keep up with, and there are no loose Velcro pieces to worry about a child running off with. 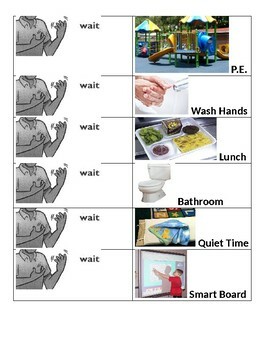 The "wait" picture on the inside of the left flap is for you to refer students to who perseverate on asking to do an activity that it isn't time for yet. 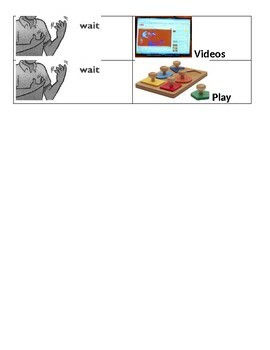 That's actually the sign language for "wait" - upturned hands wiggling the fingers. Helps with learning sign language, gives the student a physical gesture they can make to encourage them to wait, and gives you a way to silently redirect or answer a child's question without rewarding potential attention seeking behavior. Finally, the last page is a mini visual schedule, just the pictures no text. This is good for taping onto students' desks who have difficulty with transitions.